The old Scottish family of Hastings was a branch of the English Hastings family that settled in Scotland during the reign of William the Lion, King of Scotland from 1165 to 1214. The Hastings name predates the Norman Conquest of 1066 because the Castle of Hastings was held by the Hastings family when William the Conqueror landed. The area of Scotland that our Hastings family lived in was Dumfriesshire, in the southwest part. Sarah Hastings was the daughter of James Hastings, born at Drumloff, Scotland in 1763 and Sarah Muirhead, born at Moniaive in 1767. James and Sarah had a family of four girls (Margaret, Jane, Sarah and Elizabeth) and five boys (David, James, William, Thomas and John). The first three children were born at Drumloff (or Drumloft), the next four at Neis, and the last two at Crogland (or Croglin). Sarah was the sixth child in the family, born in 1806 at Neis. 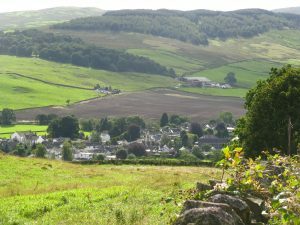 All of the foregoing places are located in Penpont Parish in the northern part of Dumfriesshire, Scotland. 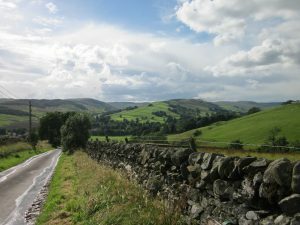 Dumfriesshire, in turn is located in the southwest part of Scotland, in the Borders region. 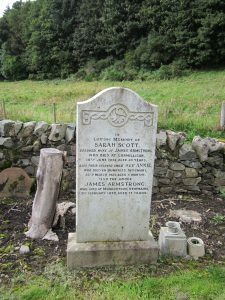 With at least five of James and Sarah Hastings’ children leaving Scotland between 1836 and 1838, we could assume that they left because the land theyhad farmed was turned over to sheep grazing. 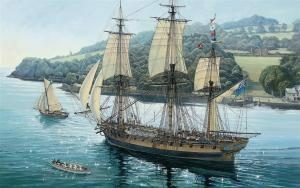 Sarah and her sister Jane were the first to leave, travelling with their families on board the Belvidera, leaving Liverpool in March and arriving in New York May 30, 1836, after eight weeks of sailing. accompanying them on the voyage was Sarah’s sister Jane, married to David Haistings (or Hastings) and their four children. According to Jane Hastings’ account, they encountered severe storms in the Atlantic Ocean and were driven back one hundred and fifty miles in one night’s storm. An account of the voyage can be found in the following article from the Wellington County museum; hastings_family_history_nicholtwp. Robert and Sarah Milligan and David and Jane Hastings and their families arrived in Nichol Township near Guelph, Ontario about 1836. The 1851 census of Nichol Township listed Robert Milligan, a farmer, age 55 and his wife Sarah, age 45, both born in Scotland, with four children, James age 19 and William age 17, both born in Scotland and Sarah, age 11 and Margaret age 9, both born in Canada. Two other children Robert and Archibald had died in infancy. Margaret’s obituary in 1932 stated that she had attended Mr. George Elmslie’s school, a well-respected grammar school in Guelph (Johnson, 1977). Mr. Elmslie was a noted classics scholar. 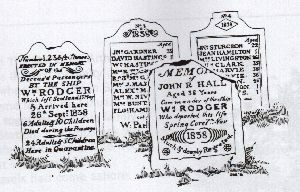 David Hastings and his wife Jane (Sarah Hastings Milligan’s sister) had five sons listed on the 1851 census; William, John, James, David and Thomas, the last three born in Canada, and attending school. The following is a list of the children of James Hastings and Sarah Muirhead and their presumed adult lives. Mary Lowrie Drumloft 1797 Keir 1829 Quarantine Station W. Sydney Oct. 12, 1838 James Hastings Brisbane Water, N.S.W. Died in infancy soon after landing in N.S.W. 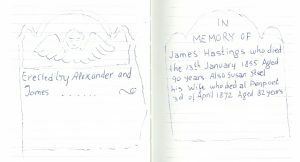 In 1990 Edna Hastings, the great granddaughter of Jane Hastings (sister of Sarah Hastings Milligan) sent a sketch of the Hastings family tombstone in Scotland (follows). 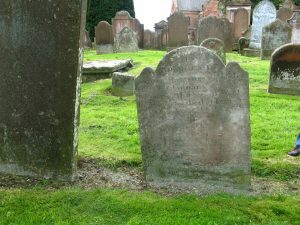 It was sent by a cousin in Scotland, Christine Hastings Hiscocks [or Hiscox], who had some contact with Margaret Milligan Mervyn (sister of James Milligan). 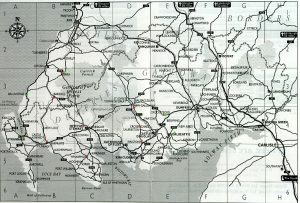 The connection dates from before Margaret’s death in 1932. 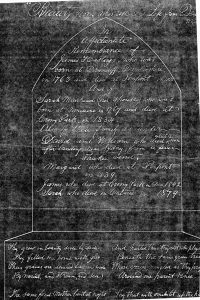 There is a mystery here; was there a large original tombstone that we never found?